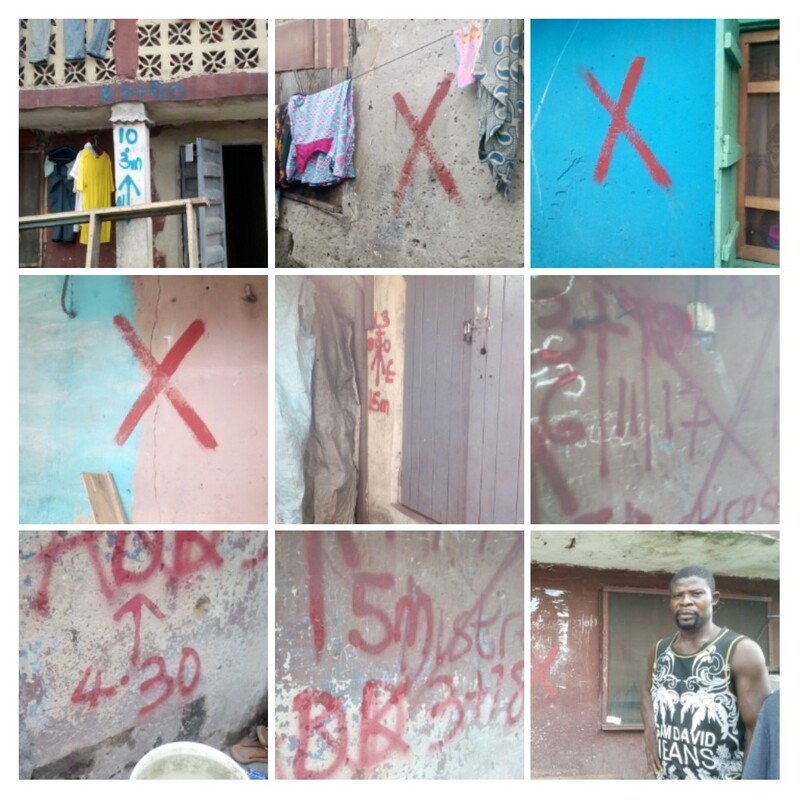 On February 19, 2018. some unidentified persons stormed Apata-Oro community, painting red marks on buildings in the community without formally introducing themselves to the property owners/occupiers or the community leaders or giving prior notice of the purpose of their visit. 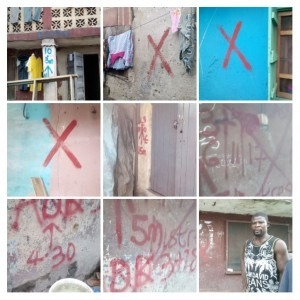 Residents became apprehensive because red marks on buildings often signaled an imminent demolition exercise, including the forced eviction of the occupants. Apata-Oro is located within Badia-East community in Apapa Local Government Area (LGA). Affected streets include Matiminu Street, Gaskia Street, Ashimi Lane, Ladejobi Street, among others. Fearing an imminent threat of homelessness, the representatives of the community approached SPACES FOR CHANGE | S4C for legal advice and support. In collaboration with the Communities Alliance Against Displacement (CAD), S4C launched an investigation to ascertain the agency and individuals responsible for the markings, consulting with various professionals including estate valuers, legal advisers, elected representatives, among others. S4C initially found that the federal government is executing a lightrail project in the neighbouring community, Ajeromi, and there were strong indications that the rail project would extend to Akpata-Oro community. In the course of the investigation, S4C engaged Akpata-oro residents, the Nigeria Railway Corporation (NRC), the China Civil Engineering Construction Corporation (CCECC), Lagos State Building Control Agency and local council authorities. It was established that the federal government was indeed implementing a lightrail project between Lagos and Ibadan, managed under the auspices of the NRC and the CCECC. Along this line, plans are underway to construct a rail terminal within the vicinity of (and possibly within) the Akpata-Oro community. Based on these facts, S4C swung into action to protect the legal rights of the affected property owners, and took steps to ensure that the land acquisition procedures for overriding public purpose complied with laid-down statutory safeguards, especially the legal requirements of consultation, compensation and resettlement. Several meetings were held with the leaders and residents of the community to determine the number of affected persons, through enumeration and property valuation for the entire community. This was done to ensure that losses can be properly documented and claimed in due course. On March 22, 2018, S4C and Communities Alliance against Displacement (CAD) convened a community legal outreach at Oko-baba community in Mainland Local Government Area (LGA), Lagos State, with featured strong participation of the affected Akpata-Oro residents. The objective of the outreach was to sensitize communities on their housing rights and obligations when faced with a compulsory land acquisition for an over-riding public purpose. Participants at the workshop were drawn from informal communities such as Oko-baba and Toluwani (Mainland LGA), Snake Island (Amuwo-Odofin LGA), Mowo-Phase II (Badagry LGA), and Ayetoro (Yaba Local Council Development Area) among others. Beyond providing legal empowerment to affected groups, S4C brokered meetings between the community representatives and other state and non-state actors involved in the land acquisition processes, such as the federal government-appointed estate valuers, chieftaincy family within the locality and other elected council representatives. The meetings aimed at negotiating better compensation terms for the affected property owners. Drawing upon all the resolutions and agreements reached between parties during the series of consultations, S4C drafted a memorandum of understanding (MOU) instrumenting the rights and obligations of various parties and interests in the Akpata-Oro community land. All the parties and their legal representatives have read and vetted the memorandum, proffering inputs and corrections. The final execution of the MOU which S4C prepared on behalf of the 18-member Landlords and Landladies Association of Ebute-Igamu and Akpata-Oro, will be executed in June 2018.